It's a mid-life crisis with scrumptious ingredients. Bread and Tulips features picturesque settings dominated by romantic Venice. It's a solid script, but a lot of the charm of Bread and Tulips is developed on the wonderfully expressive face of star Licia Maglietta. She gives ordinary great dignity and beauty. Rosalba Barletta gets left behind at a road stop while touring with her family. Rather than a disaster, Rosalba makes it an opportunity. And opportunity to reexamine her life. She's an innocent in many ways, but she has an adventurous spirit waiting to bolt free.Director and co-writer Silvio Soldini creates Rosalba's character with great warmth. I love the way she bumps into things and catches her clothing on objects at virtually every opportunity. As the film progresses, Rosalba develops grace and confidence along with her innocence. It's in Venice that Rosalba truly flowers. She meets a man who helps to change her life as she helps to change his. It's a wonderful symbiotic relationship. Soldini directs with a sure hand. He knows where he wants to go with the material and moves the story along at a graceful pace. Rosalba's journey never feels artificial. It's part actress, part director. Certainly, the editing marries with the storytelling perfectly. Rosalba is seduced from moment to moment by her experiences. She's like a blank page that attracts writing; she fills it up very nicely. Considering the beautiful settings Bread and Tulips has to show off, I think Soldini is restrained in not making this a tourist film; it's a film about people, love and character. Sometimes some people are meant for each other is a message strong and clear in Bread and Tulips. I guess the title Bread and Tulips means that, yes, we need bread for sustenance, but we need tulips too. We need romance in our lives. Soldini seems to be a patient filmmaker. He finds a natural pace for the film without letting it drag. It unfolds in some ways more rapidly as it goes along as Rosalba's life changes. Yes, it oozes charm, but I never feel like I am getting the sticky treatment. Perhaps Bread and Tulips fails to deliver at the same level of delight in the sub-plot of would-be detective Constantino's pursuit of Rosalba; a little bit of it is good, where it goes is good, but it slows down the strong romantic strain that plays so well. The fantasy or hallucinatory moments that Rosalba experiences are funny and entertaining, but I am not sure how they mesh with the overall tone of the film; while they don't take me out of it entirely, they do take some getting used to. But it's a nice combination of characters in the film from Rosalba to Fernando to Fermo to Grazia to Constantino. Along with the beautiful ebullient perfromance of Maglietta, the supporting cast amply enhanced the production. Giuseppe Battiston is quite funny as plumber/detective Constantino. 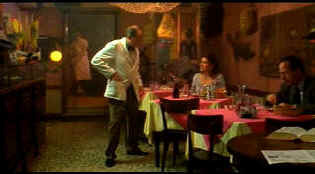 Bruno Ganz is always a strong force in an off-beat romance and his tired waiter Fernando Girasoli is no exception. Marina Massironi has an abundance of good-natured energy as masseuse Grazia and Felice Andreasi adds humorous sagacity as flower shop owner Fermo. It's a colorful transfer, nicely rendered with sharp detail. There's no edginess to the picture at all resulting in a very film-like. Good black levels, grain is at a minimum and entirely controlled. Good Shadow detail. Nice range of fleshtones. Fine details and shadings are nicely delivered. Yellow English subtitles are easy to read. Attractive surround tracks. Overall this is a very attractive DVD.